GOOD-BYE JET LAG, INSOMNIA, & AMBIEN, I hope! That was delicious…….a full night’s sleep without the need to drink myself into oblivion. After 11 straight days of insomnia, save one brief night of a 5 hr. stretch, I actually slept for almost 8 1/2 hrs. last night without waking. I silently celebrated when I finally opened my eyes this morning to discover it was 7:50am. Not 1:30am, or 3:30am, or 4am, but 7:50am! Then, with a bit of rebellion, I went back to sleep, because I could. My friend had recommended not to sleep-in but get up and take a siesta later because it was better. However, after 11 consecutive days of tossing and turning and waking and reading and writing and nonsense of all sorts, it was difficult to resist the temptation to doze off into the most wonderful dreaminess for two more hours, so I did. Now it feels like a holiday! What was the secret to my successful slumber last night? These are the three things I got yesterday that I had not had previously. 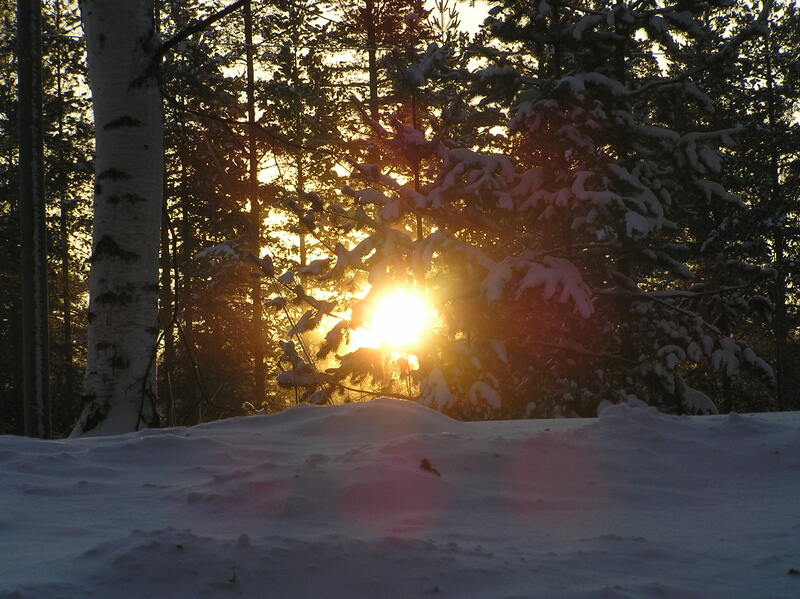 The sun actually came up yesterday, even though it was 20 below zero in this Finnish heaven. I practically ran outside to seek the sunshine on my face last morning, after adding an additional 3rd. layer to my clothing. Due to the winter darkness here in the north, the sun rises ever so slightly above the horizon for what seems to be a brief moment. Knowing this urged me to rush to capture it, even if it meant stepping onto someone else’s property, which I did after crunching down the icy driveway and road. my treasure hunt. Naturally, the people who owned the property would understand if they found me. They would know exactly why I was standing in their driveway. I was an authentic sun worshipper. There I stood, eyes opened, with just the top half of my face peaking out from my thickly wrapped layers. From my studies and research, I knew that light into the iris stimulates the hormonal responses that regulate normal sleep cycles and I knew that I needed at least fifteen to twenty minutes of the sunlight to produce the changes I needed. I also needed more of the natural light, the reflective light from the snow to help me sleep better. Natural light is extremely important for sleeping as is sunlight and exercise. 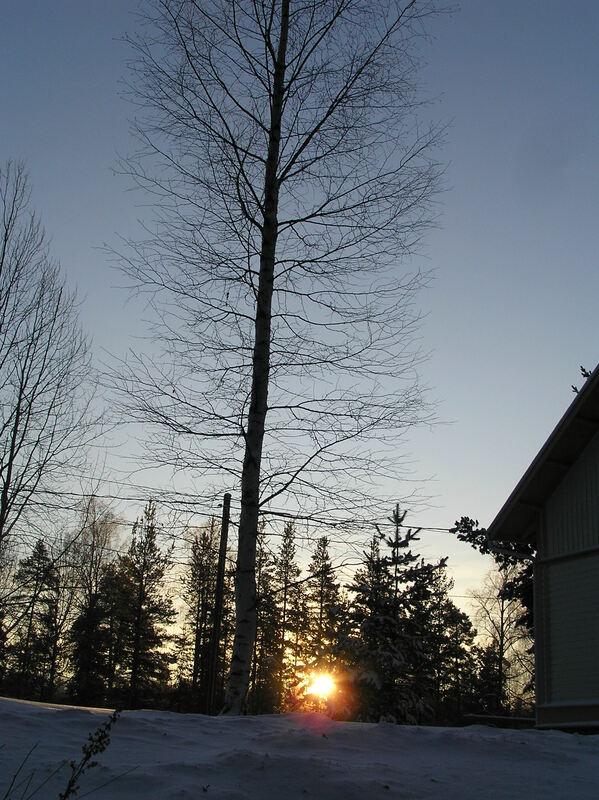 Is this also why the Finnish people do not care how cold it is; they are determined to get outside for as long as they can every day, even the children and the elderly. I have enjoyed their appreciation for fresh air and exercise. Just another affirmation regarding what I know we all need no matter our age. With this morning’s cloudy sky, it gives me a thrill just thinking of that glorious feeling of sunshine on my face yesterday. I hope it was enough to carry over because sunshine does not look like an option today! In the past, if I ever find myself ruminating over my thoughts at night, unable to sleep, I can almost always attribute it to lack of exercise and/or natural light. Insomnia doesn’t have a place when the body is in balance. Unresolved issues can be resolved better in the morning after a good night’s sleep, though I have always felt that writing my thoughts down in a journal or on a list of “to-do’s” so I don’t forget them, also helps me release them before bed so I can sleep. Then, I have no excuse. But it almost always stems from lack of exercise first, which prevents my body from shutting down; it is as if there is a clock wound up inside that just can’t stop because it hasn’t wound out yet. Yesterday, I was able to get those three necessities to a good night’s sleep in one morning walk: exercise, sunshine, and natural light. How easy it actually was to cure my insomnia! I just wish it wasn’t so darn difficult to find the sunshine around here! Today, after posting this, I will bundle up again. It is a little warmer, yet the wind is blowing and I don’t want a chance of cold air sneaking into my bundle. I will head out for my ritual brisk morning walk and enjoy the natural light at least, while it is here because it will be gone in a few hours. Wish me luck and remember that natural light and sunshine are highly underrated! Generally in the U.S., we need more of it than we get and perhaps we can give big pharma a run for their money if we take the free stuff instead: sunshine, exercise, and natural light! If it works for me here in the dark winter north of Finland, couldn’t it also work for you. Bye-Bye Ambien, hello Sun! Please leave your thoughts on this subject! I want to know there are more people out there that actually know that we have choices that are much healthier and necessary to our well-being without side effects. Oops! I forgot to credit the power of a good piece of literature, the fiction variety; books that take you away from your world so you can actually let go of your attachments enough to slumber! absent-mindedly, I committed the cardinal sin while packing for my 2 1/2 month-long trip, forgetting to include a good story or two or three to read! I finally bought some books yesterday and will be using these as well to help me sleep better. *Naysayers on global warming can ruminate on this thought: With several warm winters and the escalation of icebergs falling into our oceans, isn’t this winter just an example similar to a piece of ice being dropped into a glass of warm water? It produces a chilling effect for a short time period and then warms up again. Doesn’t this hypothesis make sense and aren’t we just experiencing the effects of a briefly cooling ocean this winter from this “ice-cube” effect? Sounds good – you’ve made me determined to get outside today! My mother-in-law has chronic insomnia, and spends most of her time inside her dark house. Next time she stays with me I will try to get her out every day. Yeah! Keep me posted on your mother-in-law. What a great post! I will have to consider those factors the next time I have trouble sleeping. On another note, has any of your research also suggested the need for complete darkness while sleeping? I have been using an eye pillow for the past several months and feel I am better rested when the lights from my alarm clock, computer, and street are not waking me all night long. THank you! It has been very refreshing to observe how in-touch with the outdoors that the Finnish people are. They know that being outside is vital to one’s well-being, no matter how cold. It was 30 below zero yesterday and a beautiful day to be outside! I have crazy insomnia when there is a full moon… call my crazy but it’s true. It has nothing to do with the brightness either. I sleep with the blinds pulled and an eye mask all the time. Maybe your primal spirit is calling you outdoors! Have you ever tried to spend at least an extra hour outside on the eve of the full moon? (seriously) Maybe it’s a werewolf thing! Imagine yourself boonie-crashing (running through the woods with abandon-preferrably naked.) This might do the trick. (Just kidding!) I personally, have never done that.